It started like any other day. Mr. Frankota was walking his dog, Monty, in a field. Surrounded by the Orlické Mountains, the field in question is located in the Kostelecké Horky village in the Hradec Králové region of the Czech Republic. On this particular day, their walk came to an abrupt halt when Monty started digging frantically. Looking closer, Mr. Frankota found multiple bronze objects surfacing, including sickles and axes. The fact that there are so many objects in one place is almost certainly tied to an act of honoration, most likely a sacrifice of some sorts. What particularly surprised us was that the objects were whole, because the culture that lived here at the time normally just buried fragments, often melted as well. These objects are beautiful, but the fact that they are complete and in good condition is of much more value to us. Archaeologists have searched the surrounding fields with metal detectors. There were some considerable changes to the surrounding terrain over the centuries, so it is possible that the deeper layers are still hiding some secrets. After that they will have to go through a conservation process. However, for the long term, we intend to keep them in Kostelec as part of a permanent exhibition in the palace, which houses various archaeological objects discovered in the region. Chance discoveries in the realm of archaeology always hold special value by virtue of the sheer luck factor and the coincidence. 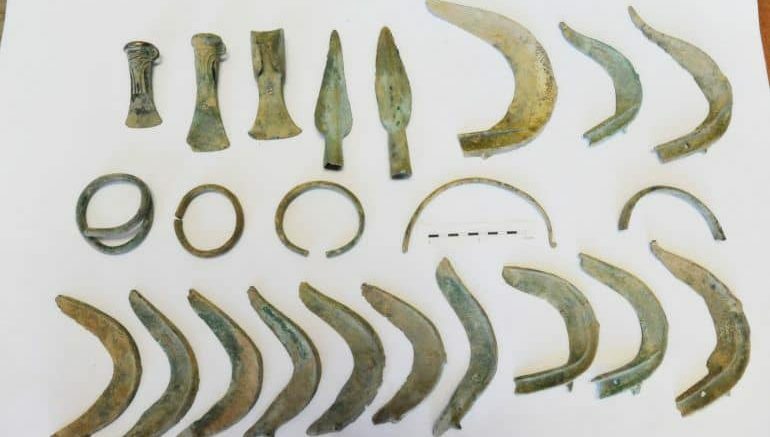 In a similar turn of events, back in July 2018, a farmer in Ireland came across four solid gold bracelets that date from as far back as the Bronze Age. As per reports, a certain Mr. Norman Witherow was digging a drain in proximity to County Donegal on June 23rd. His mechanical digger unexpectedly revealed four buried objects at a depth of 2 ft beneath the ground. By a sliver of luck, these bracelets were hidden under a rock which shielded them from any potential damage from the digger.